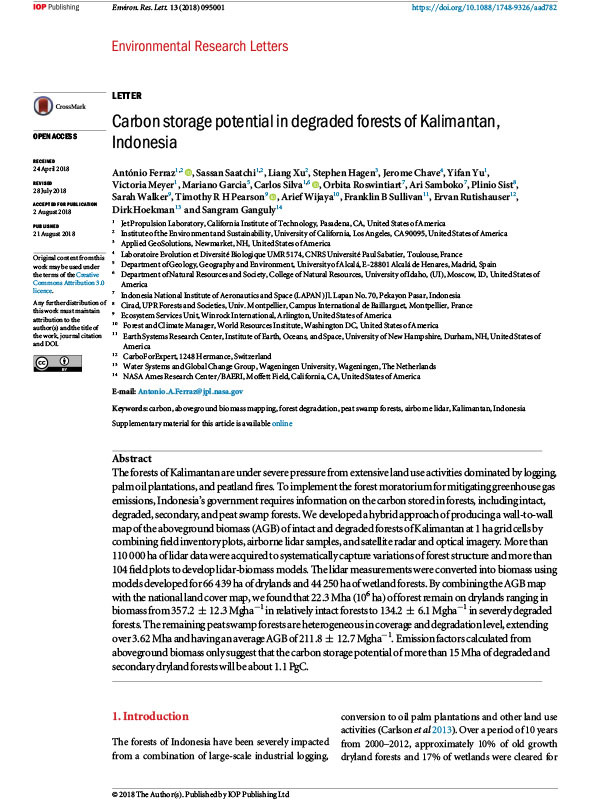 This paper published in the journal Environmental Research Letters was prepared under the NASA-funded Indonesia Carbon Monitoring System project to evaluate the carbon stocks of intact, degraded, secondary, and peat swamp forests in Kalimantan. A wall-to-wall map of aboveground biomass for the region was developed through a hybrid approach combining field inventory plots, airborne lidar, and satellite radar and optical imagery. The map was combined with a national land cover map to estimate the carbon stocks in each type of forest examined and will support the government of Indonesia in its efforts to mitigate greenhouse gas emissions from land use.